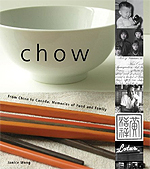 My guest today was Janice Wong, author of Chow, From China To Canada: Memories of Food and Family. It's published by Whitecap Books. It's the fascinating story of Janice's family as they became part of Canadian cultural history by operating a Chinese food restaurant in Prince Albert, Saskatchewan. Part of the book includes recipes handed down to Janice and her siblings by her father. Tell me about your favourite 'hand-me-down' recipe on my blog and you could win a copy of the book. This week I featured The Spice Trader, an organic spice shop in Toronto. In the basement below the Spice Trader, you'll find The Olive Pit, featuring olive oils and vinegars from around the world. 805 Queen St. West, Toronto, Ontario.